Clay’s Hunnter Adams drives inside for a basket early on in the first quarter of play. 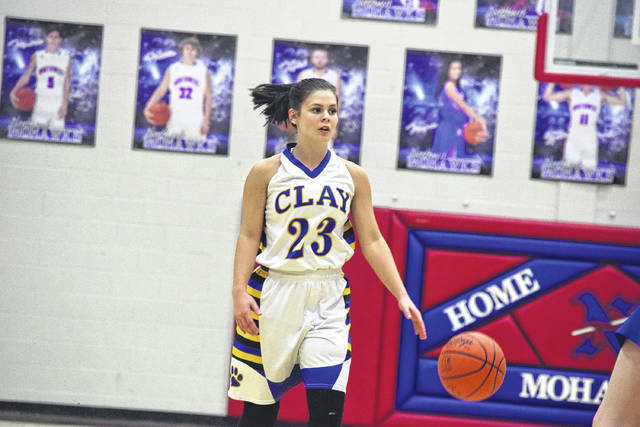 Clay’s Skylar Artis handles the basketball up at the top of the floor. 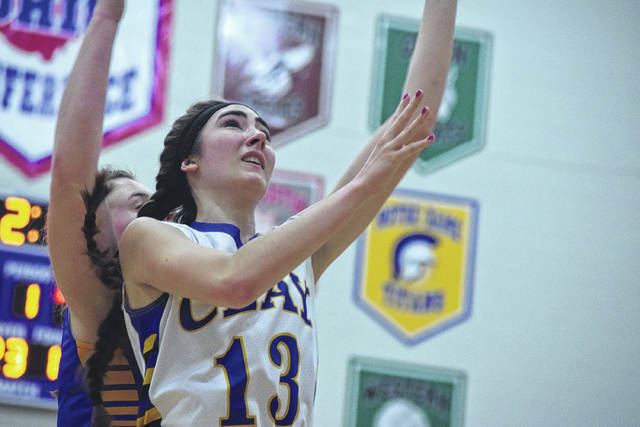 Clay’s Sophia Balestra goes up for a putback on Thursday evening against Manchester. Clay’s Cameron DeLotell attempts to drive to the basket on Thursday evening. Clay’s Jensen Warnock moves up the floor against Manchester. MCDERMOTT — In tightly contested tournament affairs, it really does only take a play or two to change the entire outcome of a contest. With the Clay Panthers’ girls basketball program trailing by a 25-18 margin with less than 90 seconds to play in the first half of a Division IV Sectional Final matchup against the Manchester Greyhounds’ girls basketball program and her team needing a spark, Jensen Warnock began to take the game over in a rapid fashion on all accounts. Warnock’s 26 points over the final 17:30, along with a tremendous defensive effort from the junior forward in addition to Skylar Artis, Sophia Balestra, and Regan Osborn, allowed Clay — who held Manchester to just three third-quarter points — to take home a 56-45 victory and advance to the Division IV, Jackson I District Semifinals in its victory over the Lady Greyhounds at Northwest High School on Thursday evening in McDermott. For Sthefany Thomas, the victory was nothing short of the team-oriented variety. From the outset, the first half of action proved to be a very competitive one as both teams ultimately combined to trade the point seven times while tying for the pole position on three additional occasions over the first quarter alone. Balestra, who obtained eight points, 10 rebounds, and three steals on the evening, combined with Warnock for eight points during the opening quarter as Clay ultimately took leads of 2-0, 4-2, 6-4, and 8-7 during the frame. 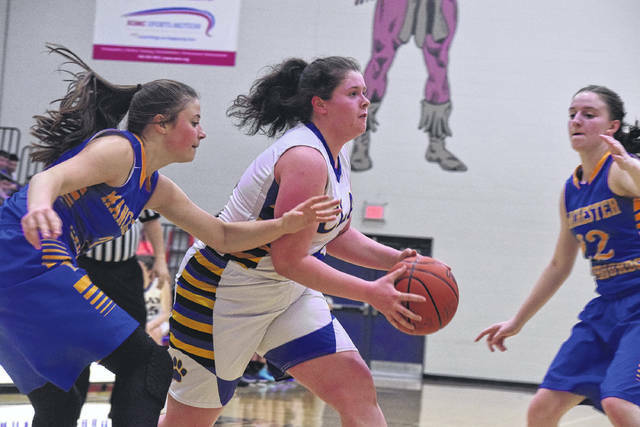 However, when Emily Sweeney banked in an acrobatic layup attempt high off of the window for an and-one attempt with 2:42 to play in the opening quarter to give the Lady Hounds a 10-8 advantage, Manchester seemed to find a groove. Despite a low-post bucket from Balestra that tied the score at 10 and a steal and layup by Warnock with 11 seconds to play that cut the Manchester lead to 13-12 after a quarter of play, the Lady Hounds ultimately buckled down and held Clay to just those two field goals over the next 5:12 of the contest as Manchester’s ability to pound the rock inside, along with the Lady Hounds’ ability to get out in the passing lanes, forced the Lady Panthers to dig out of a 19-12 hole with 5:30 left in the opening half of play. But with the quarter winding down and Clay still stuck with a 25-18 deficit, the Lady Panthers got a spark from Warnock. With 75 seconds to play in the first half, the junior forward connected on a layup from the right block, then made an excellent bullet pass to a wide-open Balestra down low on the following possession. The 5-11 forward then followed those two plays up by moving toward the right baseline and drawing a foul after being hit across the forehead, and nailed the first of two free throws attempts to spearhead a crucial 5-0 run that cut the Manchester lead to a 25-23 margin at the end of the half. To maintain that momentum, however, adjustments had to be made, especially considering that Brooke Kennedy and Sydnie Cox were having their own way on the interior. And from the opening whistle of the second half, those adjustments showed. Warnock, who got the ball rolling to end the first half, picked up right where she left off by finding an open crease off of an inbound play and nailing a wide-open layup to tie the score, then followed that possession up by draining a 10-foot jump shot after a Manchester turnover to give Clay a 27-25 advantage. While Cox ultimately battled inside en route to drawing contest and nailing a free throw, Warnock and Osborn came back by forcing back-to-back steals, which led to wide-open layups for the pair on both occasions, and a Cameron DeLotell three from the right wing, along with another Warnock free throw on a Manchester foul with 2.3 seconds to go, ultimately allowed Clay to turn the seven-point deficit that it faced toward the end of the first half into a seven-point lead (35-28) by the end of the third quarter. In the final quarter of play, Clay completely took matters over. Cox’s and-one finish inside on the left block allowed Manchester to close within 35-31 on its first offensive possession of the fourth quarter, but DeLotell obtained a massive offensive rebound on the other end for the Lady Panthers, which ultimately led to a three from dead-on by Regan Osborn. Warnock then followed that strong effort up by scoring 10 of the game’s next 15 points by mixing in a pair of low-post baskets with a pair of three-point bombs — one from the left wing and one from the right wing — to ultimately notch 14 of her 30 points in the final frame and give Clay its largest lead of the contest, 49-35, before the Lady Panthers coasted to victory the rest of the way. The three-sport athlete ultimately finished with 30 points, seven rebounds, six steals, four assists, and three blocks in a stellar all-around performance. 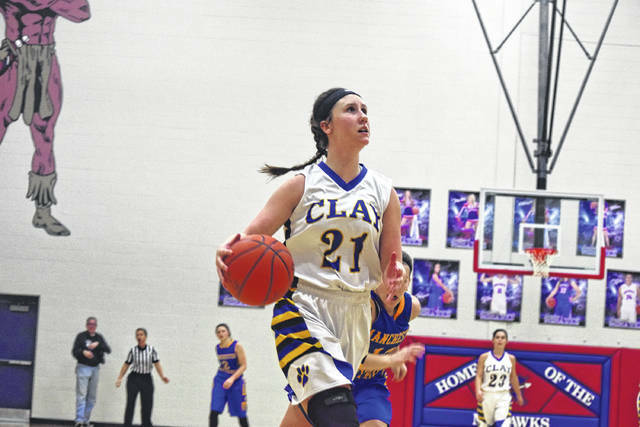 Osborn’s 12 points and three steals, along with Artis’ six assists, five steals, five rebounds, and a block, were critical for Clay, who moved to 15-8 on the year. 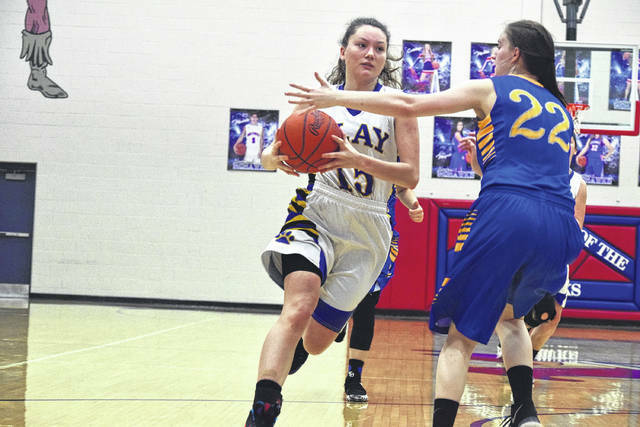 The Lady Panthers have a monstrous task ahead of it when Clay faces off against Waterford, who finished the season as the No. 1 unit in the final Division IV AP Poll at 21-1 overall and defeated Symmes Valley by an 81-18 count to improve to 22-1 on the young campaign, but at this point, Thomas knows that there’s always a chance if her unit comes to play — no matter who the opponent is.